Teach CPR with the right equipment and supplies from MCR Medical. Do you remember when you couldn’t wait to go to the pool every day of summer break? Or to the beach? I do. I remember idolizing the lifeguards not knowing how important their job really was. They were there to save lives with CPR and other training. Starting in the 1800’s, bathing, now known as swimming, became a popular recreational activity in the United States to beat the heat of summer. The first beach patrol in the United States was founded in 1891 in Atlantic City, New Jersey. The Atlantic City Beach Patrol is currently the oldest active beach patrol in the United States. But as water activity increased, so did the incidence of drowning. By the early 1900’s as many as 9,000 people drowned each year in the United States. We can thank the YMCA for creating the first volunteer lifesaving swimmers in 1912 which helped make swimming safer. In the beginning lifeguard training programs primarily emphasized personal water safety such as how to prevent drownings and protect oneself in emergencies. That all changed over time as swimming rescues were unavoidable. With the development of special lifesaving devices including the rescue buoy, the rescue tube, and the rescue board it was much safer to attempt a swimming rescue than before when you had to risk rescuing a panicked swimmer. In recent decades, lifeguards have always provided Cardio-pulmonary resuscitation (CPR) and first aid. In addition, many lifeguards are now both trained and certified to use advanced lifesaving tools such as the external defibrillator and portable oxygen. 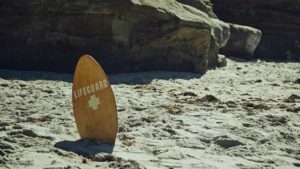 In some communities, lifeguards have taken on broader public safety responsibilities, such as advanced life support, coastal cliff rescue, and law enforcement. We like to think that we help train the lifesavers by offering quality training equipment to them. If you would like more information on our CPR and first aid training products, please call or email us. We would be more than happy to help. And remember, NEVER SWIM WITHOUT SOMEONE TRAINED IN CPR! Previous Previous post: Are You Ready to teach CPR Training?